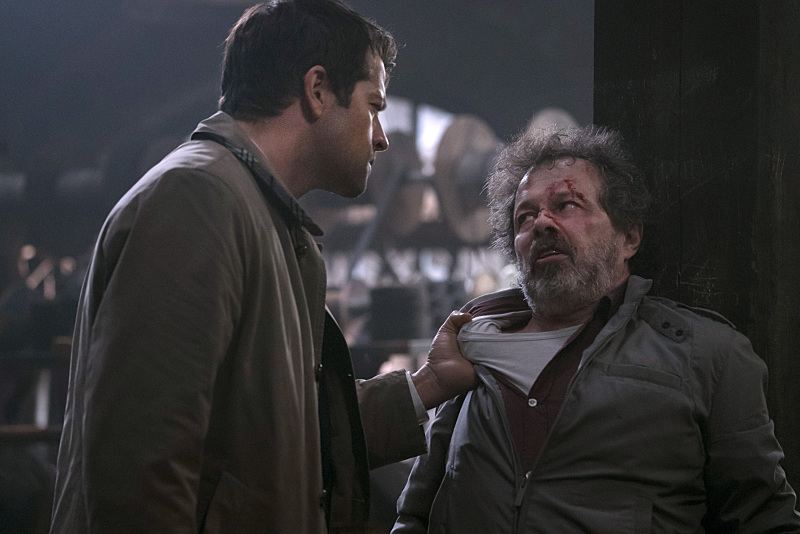 Metatron returns to cause trouble for Castiel in Supernatural’s Nov. 11 episode. The CW teases that in “Our Little World” Castiel (Misha Collins) seeks out Metatron’s (guest star Curtis Armstrong) help to stop the Darkness. However, it seems Metatron is pretty happy with his new life as a freelance videographer for the local news and isn’t inclined to help the Winchesters (Jared Padalecki, Jensen Ackles) or Castiel. And meanwhile, Crowley (Mark Sheppard) is losing his hold on a rapidly maturing Amara. John Showalter directed the episode written by Robert Berens (#1106). It airs Wednesday Oct. 11 on the CW Network. Supernatural -- "Our Little World" -- Image SN1106b_0312.jpg -- Pictured (L-R): Misha Collins as Castiel and Curtis Armstrong as Metatron -- Photo: Katie Yu/The CW -- ÃÂ© 2015 The CW Network, LLC. All Rights Reserved.